The photographic raw material is collaged as a primary montage allowing the diverse items to dictate an intuitive course for the image. Research is done on the elements which further solidifies overall thematic direction. The attempt at this stage is to unify disparate elements mainly by manipulating color, form and texture with an eye towards processing the montage as a workable texture. At this point, 3-D imaging software is used to create a virtual three dimensional space. 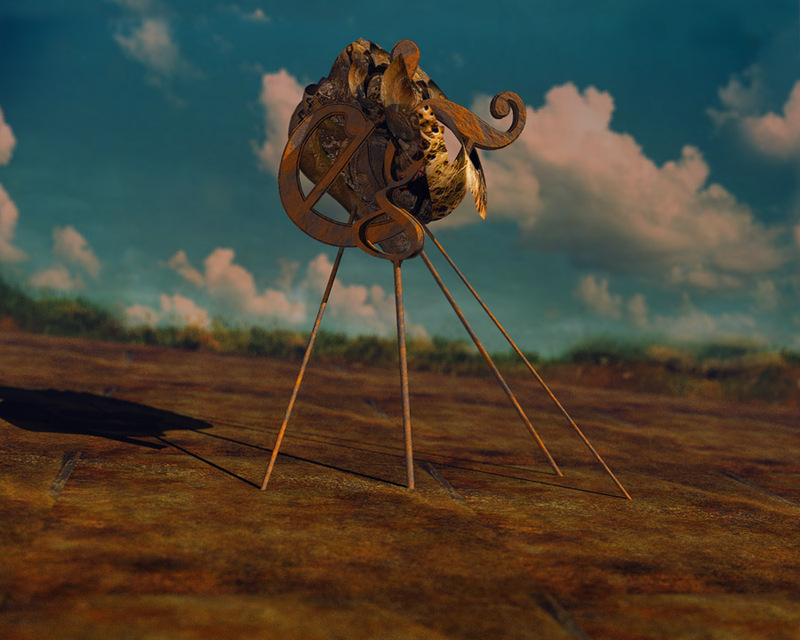 This “virtual” composition, with modeled forms is then texture-mapped using the original collage and additional real-world textures. The resulting digital matrix is rendered using a dimensional render engine, then brought back into the image-editing program where it is refined and color corrected, and finally printed as limited edition image matrix prints.